If you’re looking for an intimate, private villa with great views, you found it. MJS is just a few minutes from the beach and town, so it’s the perfect location for a couple who wants to explore the island. The villa is in great condition, perfect for honeymoons or anniversary celebrations. Villa MJS is a 1-bedroom villa located in the Flamands hillside within minutes of the beach and shopping. 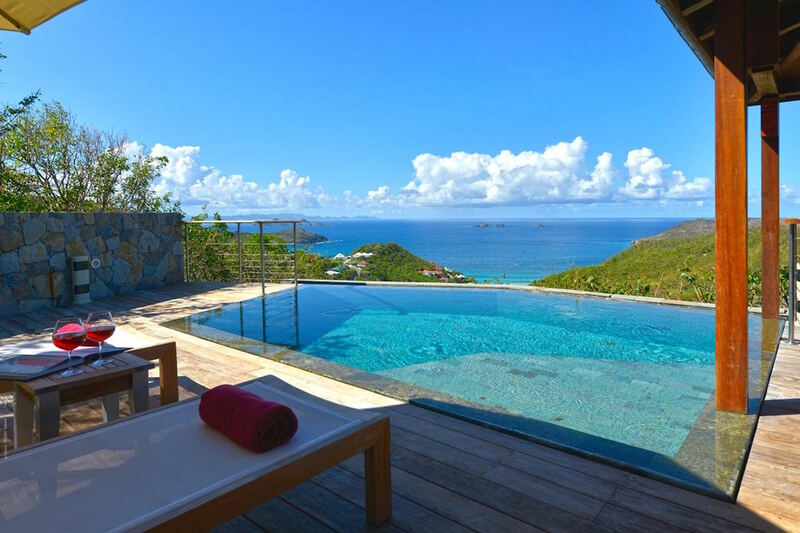 This villa offers views of the ocean and nearby islands. A deck with loungers surrounds the infinity pool, facing the panoramic view. A covered terrace adjacent to the pool has outdoor dining and a BBQ with easy access to the kitchen and living area. The spacious living room faces the ocean view and opens to the covered terrace. Plush seating faces a flat screen TV and the kitchen, creating a unified space for conversing and entertaining. The living area merges with the well-equipped kitchen via a breakfast bar. The air-conditioned bedroom is elevated above the pool and deck. It has a king-size bed, ensuite bath with outdoor shower, and ocean view. The bedroom opens to a private deck with seating that is the perfect place to take in the view. Villa MJS comes with house cleaning services six days a week, and is great for a romantic getaway.